Old Wentworth Gaol was built in 1879-1881, the small single storey brick gaol with bluestone trim was designed by colonial architect James Barnett. It was the first of the Australian designed gaols (Hay & Dubbo gaols followed this one). The bricks were made from the local clay (on-site), by Joseph Fritz, and the bluestone was transported from Malmsbury, Victoria. The gaol replaced over-crowded lock-ups and was utilised until its closure in 1927. 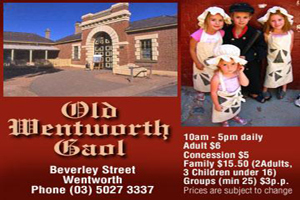 After its closure as a gaol, the building was utilised as extra classrooms for the Wentworth Central School until 1963 and today, because of its remarkable condition, is a major tourist attraction. This is a complimentary Discover Murray service. Wentworth Gaol will contact you regarding availability from your dates required. Any deposits or payments will be organised between yourself and Wentworth Gaol.